Welcome back to our biweekly review of subscription beauty boxes. Which ones are worth it? Which ones are full of junk? Reader Brandi Morgan Kirchgessner guides us through this world of mystery treats. Here’s what she’s received recently. This is my first month getting the 3B (Beauty Beyond Borders) box. It’s a popular new subscription box (popular enough that there’s a waitlist to subscribe). The boxes contain full size and deluxe samples of Japanese and Korean beauty products. 3B sent me the May box for free, so for ethical reasons, I gave away the samples after reviewing them. May’s 3B box was worth $25.48. It’s not the highest value box, but it costs only $12, so that’s not too bad. I am pretty new to false lashes, so I was happy to see these in the box. They aren’t all that natural looking, but their look is a little more subtle than many of the false lashes out there. It gave me a lot of added length and volume and brought a lot of attention to my eyes. They seem to be relatively durable, so I should get at least a few uses out of them—plus, $5.50 isn’t a bad price for false lashes. While I liked the lashes, this isn’t what I’m really looking for in a Korean box; I’d expect it to have beauty products that are nothing like what you would find in the US, not something that you can find easily here. Tony Moly is one of the biggest Korean brands in the US. Sephora carries a selection of their products. Their products have adorable packaging. Isn’t the little tangerine the cutest? The lotion smelled like tangerine, absorbed quickly, and wasn’t greasy at all. It’s supposed to be a skin-brightening hand lotion. I didn’t really notice a skin brightening effect, but I didn’t use it for long, so it might brighten your skin with consistent use. The Etude House baking powder face cleanser felt so soft on my skin. I have noticed a lot of Korean face cleansers feel very soft, which I love. My skin felt very clean and smooth after using this cleanser. Finally, I got the Tony Moly eyebrow pencil. One end of it has the eyebrow pencil and the other end has a spoolie so you can blend the color in. The color was quite dark, but had almost a reddish tint to it, so it didn’t exactly match my eyebrow color. Once I blended it in with the spoolie, though, it looked great. I’ve been using it every day and love it. This is a really great value at $6.48, so I highly recommend it. This is my second month of Beauteque and I’m really loving it. They send seven full size samples of Korean beauty products each month. I enjoy trying Korean products because they’re high quality and often a little different from things you would find in the US. This month’s Beauteque bag is worth $58.59. I couldn’t find a few of the products available for sale online, so I was unable to provide a link for those. I used the value that Beauteque listed for the items I couldn’t find online. This is currently my most expensive beauty box when you add in the shipping, so I expect this box to have a high value. The It’s Skin mist is a lightly scented water spray meant to control oil on your face. The scent wasn’t my favorite, but it wasn’t horrible, either. I didn’t really notice any oil control. The Face Shop eyelash curler is wonderful. I love eyelash curlers and needed a new one, so I was happy to see this in my box. An eyelash curler isn’t something I really want to see in an Asian beauty box, but this is the lifestyle item Beauteque sends in each box, so it’s not taking the place of a beauty product. That makes me a little more forgiving. It really opened my eyes up and provided some serious curl. I’m not the biggest fan of lip balms, so the Nature Republic balm wasn’t my favorite. I thought it would go on yellow, but it went on as a very, very sheer pink. It was softer than I would like in a lip balm. The Nature Republic Bulgarian Rose Essence is a face moisturizer. I know that a lot of people don’t really like rose scented items because they associate it with old ladies, but I love rose. This moisturizer smells so good and my face felt hydrated and smooth after use. I love it! I also got yet another black eyeliner. I can’t have a month without at least one black eyeliner coming in a beauty box. Mik@vonk is actually an Australian brand, not an Asian brand, so I was a little surprised to see this in here. Both ends of the pencil have eyeliner; one end is for a thick line, the other is for a thin line. That was a nice surprise. It goes on really smoothly, is auto-sharpening, and is easy to use. The May Island Donkey Milk masks are sheet masks. I love doing sheet masks (and all types of facial masks, for that matter). I have wanted to try a donkey milk skincare product, so I was ecstatic to find these masks in the box. Donkey milk is supposedly the milk closest to human milk and has tons of good vitamins. It is said to have anti-aging properties. I got the Mela-tox mask (for brightening) and the Aqua mask (for hydration). My friend Emily and I had a facial night: she used the Aqua mask and I used the Mela-tox. She found the aqua mask to be very moisturizing. My skin was slightly brighter. There was no real smell to the masks, in case you are wondering if donkey milk smells weird. The Holika Holika Pig Nose Clear Blackhead Steam Starter is a spot treatment for areas that have blackheads. I have no idea why it is called Pig Nose. I don’t generally get blackheads, so I was unable to try this particular product. I tried to find a friend with blackheads to try it out for me, but none of my friends would admit to having a blackhead issue, so I can’t report on its efficacy. I loved the eyelash curler, the rose essence, and the masks, but the other products were misses for me. Overall, though, I would say that this box beats 3B this month. The 3B products were okay, but there are four products in this box that I love, so I declare Beauteque the May winner as far as the Korean beauty boxes go. If you want to try out Korean products but not spend too much money, you might want to go with the 3B box as it is substantially cheaper. 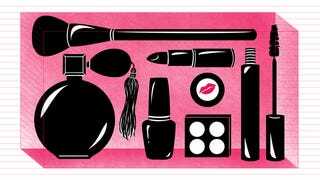 3B contains fewer products than Beauteque, so there is a trade-off. Really, though, they are both excellent boxes. You can’t go wrong either way. This is my first month getting the Vegan Cuts beauty box. Vegan Cuts sends four to seven full size or deluxe sample size vegan beauty products each month. They only sent four products this month, but they were all full size. I don’t keep vegan myself, but I like trying vegan beauty products because they are often of high quality. I absolutely love bath salts, so the Pura Botanic bath salts were a big hit with me. I saw that other subscribers got lavender and rose bath salts in their boxes, but I am so happy that I got mint. Mint isn’t a common bath salt scent, and it seems like all bath salts are rose or lavender scented. It smelled great and was very relaxing. I loved that it came in a little mesh bag so that you could just put the whole bag in the tub. It allowed the salts to dissolve, but it kept the little flower pieces in the bag so I didn’t have to try to pick them out of the drain. The Athar’a Moroccan Coffee Eye Cream is amazing. The caffeine in the coffee helps with puffiness. Even though I am not a coffee drinker, I loved the smell of it. Fortunately, the coffee smell went away in a few minutes so I didn’t have to spend the whole day smelling like coffee. It absorbs into the skin quickly and feels very moisturizing. At this point, I suspect I have more eyeshadow than I could ever use in my lifetime. I swatched this and gave it away. I was really impressed with the pigmentation on this eyeshadow. My friend Emily was happy to take the eyeshadow and found it to be long lasting. I have gotten so many Pacifica products in my boxes over the months, so I am never all that excited to see yet another one. I don’t really like Pacifica that much. The lipstick was a pretty color, but it didn’t show up all that well on my lips and it needed to be reapplied frequently. Three of the four products in this month’s Vegan Cuts box were wonderful. This was my first month trying the Vegan Cuts beauty box and I was impressed. I can’t wait to see what they have in store for June. Kloverbox isn’t strictly a vegan box. It contains natural and organic beauty products, which frequently end up being vegan. The May Kloverbox was worth $61.62. At $25, Kloverbox is my second most expensive box, so it is important that this box have a high value. But it’s also worth more than double what I paid, so I’m happy with that. The Delizioso blush is fabulous. It has some serious pigment, so a little goes a very long way with this. The first time I used it, I put on what I thought was a small amount and I ended up looking like a clown. I removed it and started again, this time with much less of the mousse, and it gave me the perfect rosy pink color. You wouldn’t know it by looking at it in the container, but it’s a very natural looking blush. It’s easy to build up the color if you want a more dramatic look. I liked the Eco-armour shaving foam and the Preserve Triple Razor System. I tried them together and got a very smooth shave. The Pomegranate and Mango scent was okay, but not all subscribers got the same scent. Although I liked the shaving foam, it is very expensive for what it is, so I just don’t see myselfl ever buying it. The razor handle is made out of recycled yogurt cups, which is pretty cool. I doubt I will trade my Intuition razor in for the Preserve razor, but it’s a good one to use in a pinch. The Eco-armour lip balm smelled great and felt so moisturizing. It is made with a lot of good oils. It wasn’t the prettiest when I opened the tube because the top of it was uneven, but I assume that is just because it’s a natural product made by a small company. I had no interest in the Triple Berry bar, so my friend Emily ate it. She loved it and wanted more. It’s made out of quinoa, amaranth, flax, and hemp, and flavored with nuts and berries. This was an okay month for Kloverbox. They didn’t wow me like they did last month. The only product I had serious interest in was the Delizioso blush. Every box has good months and bad months and what constitutes a good month or bad month varies from subscriber to subscriber, so I’ll give Kloverbox another try in June. This box is worth somewhere around $47.72. The toner sample had nothing printed on it indicating its size, so I had to estimate it. Petit Vour is a vegan box and they send four items a month to subscribers. I’ve gotten many dry shampoos in beauty boxes, so I usually don’t get too excited about getting yet another one. The Zabana dry shampoo is different, though. It gives your hair a very subtle, natural shimmer. I loved it. It also didn’t leave those horrible looking white powder spots throughout my hair that other dry shampoos often do. It brushed into my hair easily, absorbed the excess oil, and gave my hair a nice shine. This will probably be the only dry shampoo I use in the future. The Mun toner has a very subtle rose scent. Rose is great for skin, so I love this toner. The sample of it is way smaller than I would have liked, but I was able to get a few uses out of it. The Nyl shimmer scrub is probably my favorite item that I got in any of my May boxes. It’s an exfoliating sugar scrub for your body that is glittery. The sparkles are mica. I used it, thinking that it was kind of silly to include the shimmery bits when I was just going to wash it off my body in a minute. Once I got out of the shower, though, I noticed I had tons of lovely, fine sparkles covering my body. I wish the full size were not $36 because I would love to buy more of this. The Lippy Girl lipstick wasn’t my favorite. It didn’t have the color payout I would have wanted and it didn’t stay on my lips all that long. I am so happy I gave Petit Vour another chance because the Nyl shimmer scrub and Zabana dry shampoo are amazing. Petit Vour has definitely made a comeback this month. Of the natural and vegan boxes, Petit Vour wins. Vegan Cuts is a pretty close second. Of the Asian boxes and vegan and natural boxes, Petit Vour is the winner. Beauteque was great, but it just did not have the shimmer scrub. The shimmer scrub is so amazing that any box that contained it would win. Overall, though, May was a strong month for beauty boxes. I discovered a lot of great new products and no box was a complete miss. Come back in two weeks to find out what June has in store for us, and I would love to hear all about your beauty boxes in the comments. Brandi Morgan Kirchgessner has always loved getting mail and wearing makeup, so she was ecstatic to discover beauty boxes. She lives with her three dogs, and five cats.